What is a Feed the Future Innovation Lab? Feed the Future Innovation Labs are research programs that draw on the expertise of top U.S. colleges and universities in collaboration with research and educational institutions in developing countries to tackle some of the world’s greatest challenges in agriculture, food security, and nutrition. 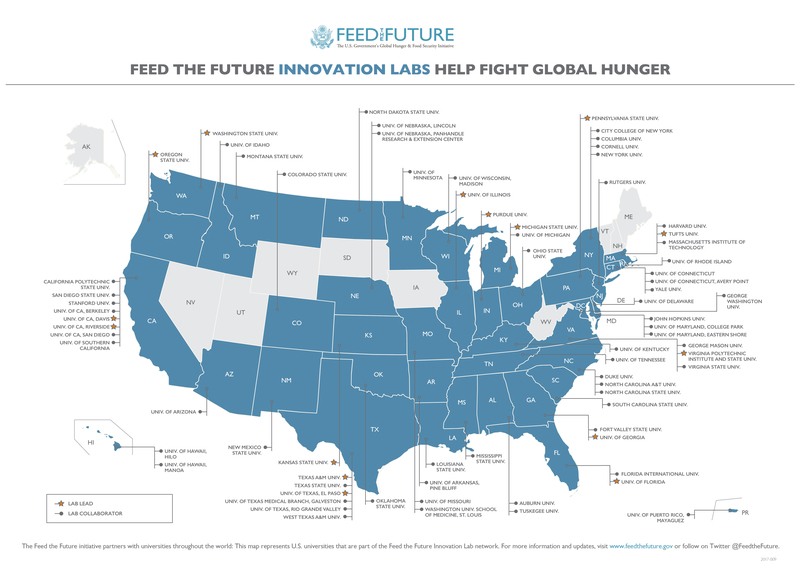 Led by U.S. universities, the Feed the Future Innovation Labs are on the cutting edge of efforts to research, develop, and take to scale safe and effective technologies that address current and future challenges posed by a changing climate and the need to feed a growing global population. One important aspect of Feed the Future Innovation Labs is the collaborative partnerships they build across borders, accessing knowledge of American universities and building the capacity of scientists in developing countries. Working across Africa, Asia and Central America, the Horticulture Innovation Lab is a global research network that advances fruit and vegetable innovations, empowering smallholder farmers to earn more income while better nourishing their communities. Elizabeth Mitcham is the director of this program, which has been led by the UC Davis Department of Plant Sciences since 2009. Working across Africa, Asia and Latin America, the AMA Innovation Lab supports research on policies and programs designed to help poor and smallholder farmers worldwide to manage risk, adopt productive technologies and take an active part in economic growth. Michael Carter is the director of this program, which has been based in the UC Davis Department of Agricultural Resource and Economics since 2012. The Genomics to Improve Poultry Innovation Lab applies advanced genetics and genomic approaches to enhance innate resistance to Newcastle disease and tolerance to heat stress, to improve the chicken production by households and smallholder farmers in Africa. Huaijun Zhou is the director of this program, which is housed in the College of Agricultural and Environmental Sciences International Programs Office. The Climate Resilient Chickpea Innovation Lab emphasizes the crop-based traits of climate resilience and nutrition, focusing genetic improvement on the needs of smallholder farmers in Ethiopia and India. Douglas Cook is the director of this program, which is part of the UC Davis Department of Plant Pathology. See a list of all 24 Innovation Labs on the Feed the Future website. The programs currently called the "Feed the Future Innovation Labs" were originally called "Collaborative Research Support Programs" (or CRSPs). Support for these long-term collaborative research collaborations between U.S. universities and the U.S. Agency for International Development was authorized under Title XII of the International Development and Food Assistance Act of 1975. These programs focus the scientific expertise of U.S. universities to improve agricultural productivity and enhance food security. Learn more about Title XII from the Association of Public and Land-grant Universities. More information about CRSPs and Innovation Labs is available on the CRSP Digest Project website. Feed the Future is America's global hunger and food security initiative. With an emphasis on smallholder farmers — particularly women — Feed the Future supports a country-led approach to reduce hunger, poverty and undernutrition by promoting growth in the agriculture sector. See how Horticulture Innovation Lab research projects contribute to Feed the Future's global objectives. With research across the horticultural value chain, the Horticulture Innovation Lab's research portfolio addresses issues related to inclusive agricultural-led growth, strengthened resilience and improved nutrition.